2 lb. 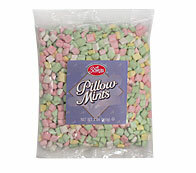 bag of bulk pillow mints. Available in assorted only. 2 lb. bag of assorted pastel pillow mints. Great for making favors or putting out in candy dishes.